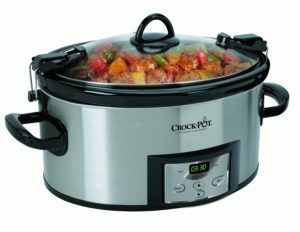 If you have been looking for a new crock-pot, check out this deal! You can get this Crock-Pot 6-Quart Programmable Cook & Carry Slow Cooker for only $31.79! You will be saving 47% on this purchase because this crock-pot is normally $59.99! This crock-pot includes a digital countdown control that allows you program cook times anywhere from 30 minutes up to 20 hours. It also shifts to the warm setting automatically once cook time completes! Make sure that you grab this deal soon because the prices can change at anytime on Amazon! CLICK HERE TO ORDER Crock-Pot 6-Quart Programmable Cook & Carry Slow Cooker for only $31.79 today!